The Father of our country was not Catholic, but he was a deeply devout Christian who followed the teachings of Jesus Christ in every aspect of his life. This book teaches children about the life of George Washington and inspires them by his strong faith, character and courage. George’s stepgranddaughter, Nelly wrote, “He was not one of those who act or pray, that they may be seen of men. He communed with God in secret”. Washington is a fantastic example of strong faith and character that all children will enjoy reading! 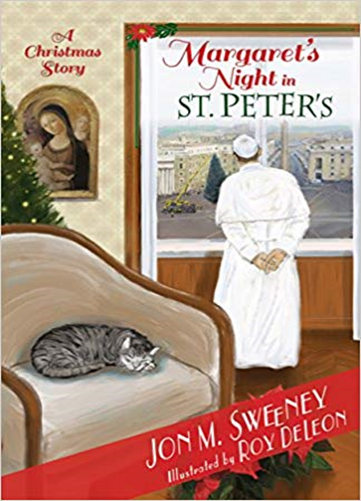 Just in time for Christmas comes Jon M. Sweeney’s second book in the new series about Margaret, the Pope’s Cat. The story continues Margaret’s exploits around the Vatican much to the amusement of the Pope. However, there are some in the Vatican that find Margaret’s free-reign of such an important and historic place quite irritating. Although her favorite spot is in the pocket of the Pope’s Cossack, Margaret still manages to explore the vast buildings and sees the most beautiful statues and art in the entire world! The curious feline cannot figure out why there is so much activity, extra papers and serious faces on December 24. The Pope stroked Margaret behind her ears and whispered, “Urbi et orbi means, ‘to the City and to the World,’ my dear”, as they walked outside onto the portico of St. Peter’s Basilica. As the Pope stepped to the microphone, Margaret tucked herself back inside his cassock. As Margaret’s adventures in the Vatican continue in this second book, children will learn more about our Catholic faith as they enjoy this curious cat! Two new Pope’s Cat series books for children coming soon: Margaret’s First Holy Week and Margaret and the Pope Go to Assisi. I can’t wait to read them both! "Today I Made My First Communion"
Today I Made My First Communion written by Dianne Ahern, is a MUST for children preparing for their First Holy Communion. Just as in Today I Made My First Reconciliation, two friends, Riley and Maria are attending religious education classes to prepare for First Communion. Both still have many questions about the Mystery of the Eucharist as well as feeling nervous about the big day. With a devoted parish staff, a lot of prayer and some help from above, they resolve the mystery and joyfully make their First Holy Communion. A wonderful narrative for all children! "Today I Made My First Reconciliation"
Today I Made My First Reconciliation written by Dianne Ahern, is a MUST for children preparing for their First Reconciliation. Going in the confessional for the first time can be a bit intimidating for children. It often is for adults as well! This book explains the meaning of “reconciliation”, why we feel the way we do when we sin, examination of conscience and how to ask for forgiveness and really mean it. The book is a narrative about friends, Riley and Maria, who commit a sin while playing outside one day. They both struggle with what they have done and learn through a series of encounters with important people in their lives how to best live by God’s Commandments, reconcile and perform penance. A wonderful story for any child, especially those preparing for their First Reconciliation. "The Queen and The Cross: The Story of Saint Helen"
The Queen and the Cross, written by Cornelia Mary Bilinsky, is a wonderful blend of tale and history. Helen, the heroic empress and mother of Emperor Constantine, is on a mission to find the true cross upon which Jesus died. The elderly queen travels to the Holy Land to find the precious cross. Children will enjoy traveling on this quest with Queen Helen and will experience the excitement and joy as she finds not one, but three crosses! This short story teaches children the story of how Helen’s tenacity helps her find the true cross and illustrates how an elderly woman’s strong faith and devotion to Jesus guides her journey and helps her to become a Saint. A fun, interesting story to teach a little history of our Catholic faith. "The Little Flower: A Parable of Saint Therese of Lisieux"
Writer Becky Arganbright has adapted Saint Therese’s lesson of the little flowers into a delightful parable for children. As a young girl, Therese learns that even though she might be little, with the help of God, her littleness can be a way of doing great things for God. This book is a wonderful way to introduce children to the spirituality of Saint Therese’s “little way” with its lesson that even the littlest act, done with great love, is beautiful in Jesus’s eyes. Just look at that face! You have to love Humphrey! This sweet story about Humphrey the camel’s first Christmas is both written and illustrated by Carol Heyer. Ms. Heyer’s artistic skills are extraordinary and have been featured in many children’s books and movies. Humphrey is having an extremely rough time in the caravan that he is traveling with through the desert. He has lost his dearest possession, a carpet blanket. He believes that his name should be “Beloved, Most Beauteous and Exalted King of All” instead of Humphrey, and he keeps hearing talk of kings that seem to bring joy to everyone but him. All Humphrey can think of is how cold he is without his blanket, carrying heavy chests and that they call him Humphrey instead of “Beloved, Most Beauteous and Exalted King of All”. It is just too much! Finally, the caravan reaches the end of the journey. Instead of a palace and kings, he sees a stable with a family inside. Humphrey moves ever so slowly toward a baby in a manger. He takes his dearest possession, the blanket, and lays it carefully upon the baby. He says, “Beloved, Most Beauteous and Exalted King of All” should be his name. But, instead they call him, “Jesus”. Great story! It will bring a tear or two of joy to your eyes! I really thought that the coolest thing I had ever seen made of Lego’s was the giant Sea Serpent peering out of a lagoon at Disney World. That was until I took a look at this boxed set of the Old and New Testaments. The Bible stories are completely illustrated with LEGO’S!! Amazing what can be created with these little pieces of plastic! Even more amazing is watching a child get excited about reading the Bible! Children are mesmerized by all of the Lego people and scenery in these versions of the Old and New Testaments. The language used to tell the stories is on a level that children can understand without losing meaning. The people and scenery are colorful, creative and made to immediately catch the attention of children. A HUGE hit with children! Disclaimer: This set does not have the Imprimatur.